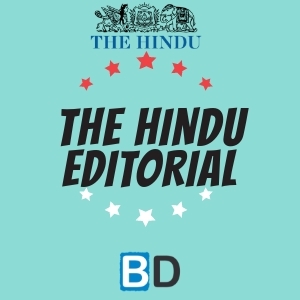 THE HINDU EDITORIAL – March 18, 2018, is one of the must-read section for the competitive exams like NIACL AO Prelims Exam, IBPS SO Mains Exam. These topics are widely expected to be asked in the reading comprehension, Cloze Test or Error Detection in the forthcoming exams. So gear up your Exam preparation and learn new words daily. The pedestrian bridge that collapsed at Mumbai’s Chhatrapati Shivaji Maharaj Terminus, leaving six people dead and several injured, underscores the irony of India’s race to development on creaking urban infrastructure. It was only in September 2017 that there was a stampede at Mumbai’s Elphinstone bridge that left at least 23 people dead, an incident that officials blamed on heavy rain and overcrowding on the rickety structure. Beyond such acute disasters, there is the chronic toll of eight people, on average, dying every day on the city’s railway tracks. This is a dismal image for a metropolis that generates so much wealth, but cannot guarantee the safety of its public infrastructure. In the first response to the CST incident, the Maharashtra government and the Brihanmumbai Municipal Corporation (BMC) have launched action on the contractor who carried out repairs on the bridge five years ago, the structural safety auditor who had certified the bridge to be in ‘good’ condition among a total of 39 bridges, and some civic body officials. Such steps may serve to mollify public anger, and no one would argue against efforts to fix accountability for lapses. However, far-reaching administrative reform is necessary to raise public confidence in the way government works. It is extraordinary that the BMC is wiser after the fact, and has determined that the quality of repairs performed on the CST bridge was not ‘up to the mark,’ since it collapsed within six years. It has also closed several busy footbridges, virtually confirming prolonged neglect of maintenance. In a city where eight million passenger trips are made daily on an overburdened railway system, besides other modes of transport, the highest policy priority should be to raise levels of safety. In the wake of the bridge disaster, the municipal corporation must explain how much of its annual budget of ₹30,692 crore for the coming year will go towards improving facilities and safety for the majority of its citizens who ride trains and buses or walk. Mumbaikars badly need a new deal in the form of a modernised bus system, with expansion of services that can be funded through a levy on private vehicles or on fuel. The move to privatise BEST bus services may result in greater pressure on other systems, reducing access and adding to the stress faced by citizens. Mumbai’s experience should serve as a warning to all fast-expanding Indian cities governed by municipal systems that have low capacity and capability to create people-friendly infrastructure. Distortions in urban policymaking in recent years are all too evident, marked by support for loosely defined smart cities and personal vehicles, at the cost of basic interventions that will make the commons more accessible — roads, pavements, pedestrian facilities and public transport. The safe mobility of people must be prioritised. New Zealand was shaken to its core on Friday when at least 49 people were killed by a gunman in two mosques in Christchurch. Brenton Harrison Tarrant, the suspect, livestreamed the massacre on social media after releasing a white supremacist manifesto that called for removing the “invaders” and “retaking” Europe. The 27-year-old Australian, who the authorities said was not on any intelligence watch list, apparently travelled to New Zealand to carry out the attack. His targets were clearly Muslims, who make up less than 1% of New Zealand’s population. The manifesto and the symbols he carried suggest that he was influenced by far-right terrorists and their anti-Muslim, anti-immigration and anti-Semite ideology. He came in military fatigues, wore neo-Nazi emblems and was listening in his car to a song devoted to Bosnian war criminal Radovan Karadžić. The manifesto lauds Anders Breivik, the Norwegian far-right terrorist who killed 77 people in 2011 and released a 1,518-page racist manifesto. He saw President Donald Trump as a “symbol of renewed white identity and common purpose”. Right-wing racist terror, which has largely been on the fringes in the post-War world, is emerging as a major political and security threat, especially in white-majority societies. In recent years, mosques in Germany and France have been targeted; in Britain an MP was stabbed to death; and in the U.S. a synagogue was attacked, leaving 11 people dead. In most cases, the attackers were obsessed with immigration and the far-right ideas of Euro-Christian white racial purity, which is fundamentally not different from the ideology of the Nazis. The language these attackers use resembles that of mainstream anti-immigrant politicians in Western countries, such as Mr. Trump, who wanted to ban Muslims from entering the U.S.; Viktor Orbán, the Prime Minister of Hungary, who wants to defend “Christian Europe”; or Italian Interior Minister Matteo Salvini, known for his hardline views on migrants. Besides, a number of far-right parties known for their Islamophobic, white nationalist views are either in power in Europe or are on the rise, be it the Freedom Party of Austria, the AfD of Germany or the National Front of France. While they and their leaders set the broad contours of anti-immigrant, anti-Muslim and anti-Semitic politics as part of their nationalist narrative, neo-Nazis such as Breivik and the Christchurch shooter are killing common people. Societies worldwide should wake up to the growing danger right-wing racist terrorism poses, and not view it as mere isolated, irrational responses to Islamist terror. It has to be fought politically, by driving a counter-narrative to white supremacism, and by using the security apparatus, through allocation of enough resources to tackle all threats of violence. Meaning : making a harsh, high-pitched sound when being moved or when pressure or weight is applied. Meaning : causing a mood of gloom or depression. Meaning : a brief or temporary failure of concentration, memory, or judgement. Meaning : having made a firm decision and being resolved not to change it. Meaning : (of a place) able to be reached or entered. Meaning : designate or treat (something) as being very or most important. Meaning : have an idea or impression of the existence, presence, or truth of (something) without certain proof. Meaning : as far as one knows or can see. Meaning : have an influence on. Meaning : very loving or loyal. Meaning : a public declaration of policy and aims, especially one issued before an election by a political party or candidate. Meaning : an ornamental border of threads left loose or formed into tassels or twists, used to edge clothing or material. Meaning : make a thrusting gesture or movement at something with a pointed object. Meaning : an outline representing or bounding the shape or form of something. Meaning : preoccupy or fill the mind of (someone) continually and to a troubling extent. Meaning : have a similar appearance to or qualities in common with (someone or something); look or seem like. Meaning : the ideas, attitudes, or activities that are shared by most people and regarded as normal or conventional. Meaning : a person who comes to live permanently in a foreign country. Meaning : the action or process of allocating or sharing out something. Meaning : not logical or reasonable.